I look from my window. A young team stands, making ready to play. Their hair is in team colours, their faces full of enthusiasm and their coaches encouraging. Will they win? Will they have fun? The whistle blows. The kick-off drives the ball towards them. Parents run along the sideline yelling at players to kick the ball. The ball is lost. The opponents score. 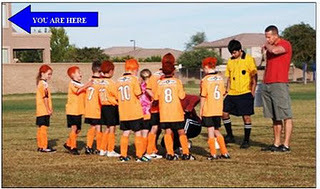 Fury is in the eyes of some parents, blame levelled at the players they see at fault. The team lines up again, the enthusiasm of their faces lost. A tear rolls down the cheek of one. This is so sad to me. We hear about bad sport parents all the time. When we were young, and having pick-up games of soft ball or kick-ball in a grassy field, there were no parents pushing us to succeed. It was fun! Life just isn’t like that for kids anymore. Thanks for the comment, Judie. It is sad and I know there is determination by some clubs to remove parents such as the ones on the story. Children’s sport should aim at being fun then perhaps working to win. Unfortunately I’ve seen way too many of just these same parents who live vicariously thru their children, not realizing or not caring that they are scarring their young lives. Well done on the take. Thanks for the comment, Anita. As I really do look out from my window and can see children playing soccer, I have seem parents like the ones in the story. What is pleasing is seeing the numbers of them have declined in more recent years. I’ve seen way too many parents exactly like that Ross. It saddens and sickens me. And you just know those kids are going to turn into ‘those’ parents someday! I liked the direction you brought to this prompt. There has been efforts to eliminate parents like that from the sidelines in Australia. They can find themselves banned from watching so the children can have the fun youth sport should be.